Heralded by The Times as “just the sort of champion the newest of new music needs”, while being praised as “impeccable in his pianism and unfailing in his idiomatic grasp” by Gramophone, Takenouchi’s curiosity and a natural penchant for integrity makes his playing and vast repertoire unique amongst his generation of pianists: his love for the music of classical masters – particularly Haydn, Beethoven and Chopin – sits side by side with his passion for the music of Medtner and Rachmaninov, lesser-known British composers such as Sterndale Bennett and Parry, and the contemporary repertoire. As a soloist, he has recently appeared on many concert platforms including the Wigmore Hall, Tokyo Opera City, the South Bank Centre. In the recent years, he has given recitals in the UK, France, Japan, Austria, Germany, Switzerland, Portugal, Italy and Canada. His more unusual appearances include the BBC Four documentary The Prince and the Composer on the life and music of Parry alongside HRH The Prince of Wales, and recitals at the “Raritäten der Klaviermusik” (Rarities of Piano Music) Festival in Germany. 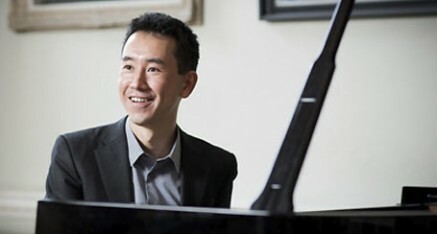 Takenouchi’s eclectic discography includes his latest album of 4 keyboard sonatas by Haydn (Artalinna), a highly acclaimed disc of piano concertos by Catoire and Sherwood (world première recordings) with the Royal Scottish National Orchestra (Dutton Epoch), and Cosmos Haptic: Contemporary Piano Music from Japan (LORELT). He has also made world première recordings of works by James Dillon (NMC), Edwin Roxburgh (NMC) and Jeremy Dale Roberts (LORELT), as well as a set of CDs of piano arrangements of Delius’s orchestral works (SOMM with Simon Callaghan). Takenouchi is also committed to education. Since 2012 he has been teaching piano at the Royal Conservatoire of Scotland. He also returns every summer to give masterclasses at the Poros International Piano Academy (Greece) and the Ingenium International Music Academy (UK).